The home of Mr. and Mrs. Frank A. Hecht in Barrington Hills c. mid-1920s. Photos courtesy of Bellarmine Jesuit Retreat House. Birds announce the dawn, deer and fox make tracks across the spacious grounds, and a few pheasants still inhabit the shrubbery and native woodlands that form some 80 acres of an extraordinary property established in the third decade of the 20th century. In 1947, its owner, the Hecht family, leaves this Eden with regret. And yet they are reassured; the new stewards of the property are from the Chicago Province of the Society of Jesus, who are planning to create a Retreat House where men, seminarians, and youth from Catholic schools, and eventually women, may spend some time in quiet spiritual reflection, preparing to face a jangled world. They welcome the serenity of their surroundings. They are also acquiring an architectural gem in the residence itself. This is in 1947, but the story of this property as it exists today begins in 1924, in the transformative years of Barrington’s countryside from pioneer farms to country estates. On June 4, 1926, the Chicago Daily Tribune reported that John C. Kellogg, head of the Kellogg Box Company of Battle Creek, Michigan, had purchased the residence of Frank A. Hecht at 2952 Lake Shore Drive in Chicago. Frank Hecht was noted as the president of the Kaestner and Hecht Company, who were elevator manufacturers. The Hechts were moving to the country from Chicago, and had acquired their acreage in Barrington from Mr. and Mrs. Robert Hammond. The Hammonds were clearly divesting themselves of their holdings which had totaled more than 300 acres. The Hammonds remained, however, with the Alexander Reichmanns to the east (see our page back essay) and now the Hechts to the west. Famed architects David Adler and Robert Work created the architectural plans for the Hecht’s Barrington home in the mid-1920s. The Hecht’s fondly named their new country retreat “The Meadows”. By 1947, they had moved on. The Hechts called their property “The Meadows” and it is probable that the original design of the 16-plus room residence was the collaboration of David Adler and Robert Work, who were in partnership from 1917 to 1929. Robert Work already lived across the County Line Road. All the original principal public rooms of the residence and the grand entry foyer bear the hallmark of David Adler’s work. 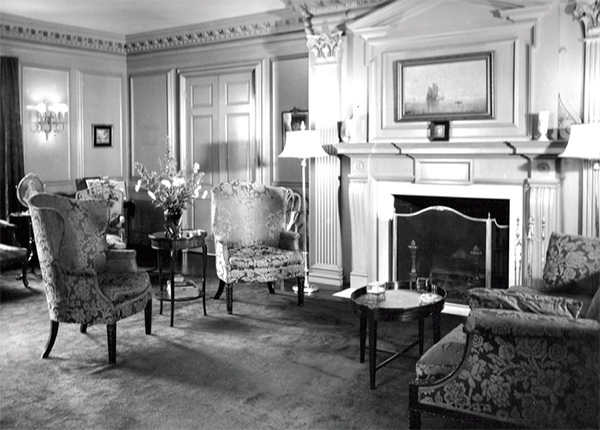 The glorious paneled library with its crown and dentil moldings; the proportions of the dining room with its Grecian columns and bay window, and the adjacent living room, both Georgian in style; elegant fireplaces and mantel surrounds; the rooms all entered from the black and white tiled reception hall. There a classical winding staircase, with hand-milled spindles sweeping to the second floor, showcasing three unique spindle patterns that repeat. All is similar in scale and style to well-documented Adler designed residences. The priests and brothers of the Society of Jesus have been loving stewards of their surroundings. The only major change in this part of the residence is that the original kitchen has been sensitively remodeled into a large office, reflecting the style of the other public rooms. Cabinetry from the butler’s pantry leading to the dining room remains. 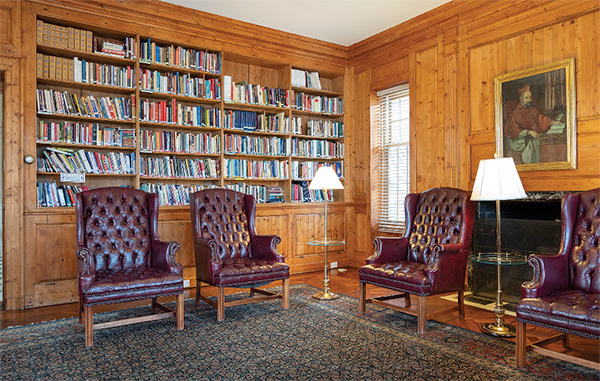 The library and living room with fireplace are original to the Hecht home. Bottom Left: The dining hall for retreatants is in the addition. The classical garden and terraces originally designed by Nellie Hammond that were the pride of the Hechts have been largely preserved. This trio of neighbors, Clara Hecht, Nellie Hammond, and Edith Reichmann were among those early and accomplished Garden Club of Barrington charter members who would bring distinction to our area, offering juried flower shows, garden walks through their spacious properties, and horticultural contributions to the civic landscape. From the year 2000 to 2018, a local nonprofit, Hands of Hope, held its Barrington Country Garden & Antique Faire, adopting the traditions of hospitality first offered by those original countryside estate owners. The beauty of the Hechts’ garden is seen in a 1939 photograph that appeared in the Garden Club of Barrington’s 90th Anniversary book, and a leather-bound album of images from the Hechts’ time has been carefully preserved by the fathers. In recent years, Father George Steenken, S.J. received awards from the Council of Barrington Garden Clubs for his stewardship of the grounds. From these halcyon surroundings, Army Chaplain Father James S. McGinnis, S.J., founded Bellarmine Hall, now Bellarmine Jesuit Retreat House, in 1948. His inspiration for the name was Saint Robert Bellarmine, who lived from 1542 to 1621. He was both a Jesuit and a Cardinal, a papal advisor, and a distinguished 17th century theologian. He was canonized in 1930 and named a Doctor of the Church the following year. St. Robert Bellarmine is considered the patron saint of this retreat house because in his preaching he embodied the integration of head and heart, and of contemplation and action. Jesuits are also known as members of the Society of Jesus, founded by Saint Ignatius of Loyola who wrote the Spiritual Exercises which serve as the foundation of the retreats at Bellarmine. A visitor interested in the history of Bellarmine is greeted in the library by Father James Gschwend, S.J., Ph.D., Father Jim as he is familiarly known. 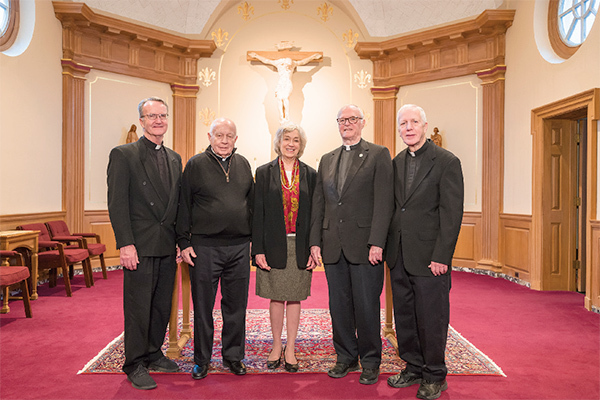 He first came to Bellarmine Hall as a seminarian in 1954, spending the next five years investing in the spiritual life of a Jesuit, before going out to pastoral service. After a long teaching and administrative career, he returned here 10 years ago to a Retreat House that has almost tripled in size. He graciously gives a tour worthy of a museum curator of the now vast public and private rooms. The Hechts would recognize this place. Way, way back from the County Line Road, the peace and quiet that they so valued lives on, even though thousands of people have traveled that peaceful, long drive to spend days in spiritual renewal. Father Jim leads the way into the last, westerly room of the original residence, the very spacious living room that served as a chapel in the early years of Bellarmine. Like the adjacent dining room, it has almost ceiling height windows bringing light in at both ends of the room. This light and scale would inspire all the following additions that would eventually bring the entire building to a total of over 53,000 square feet. The first addition in 1957 took place under the leadership of Father James J. Mahoney, S.J., who was Director from 1949 to 1967. The success of the Retreat House and its popularity created the need for more extensive specialized spaces, and to that end, the Jesuits sought out the architectural firm of Barry and Kay, renowned especially for their designs of religious institutions. Among their many well-known commissions were the Church of Our Lady of Perpetual Help in Glenview, and, considered to be an Art Deco masterpiece, St. Ferdinand’s Church on the west side of Chicago. For the 19,000 square foot Bellarmine Retreat House addition, the architects took as their inspiration the original residence. 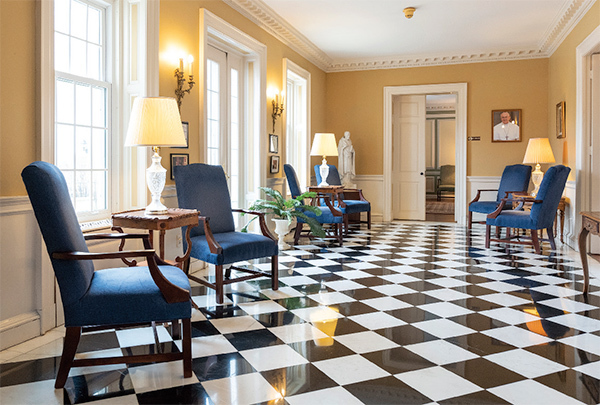 On the main floor, there is an almost seamless transition into a tile floored hallway in the shape of a cross. To the south, the new Chapel of the Sacred Heart with its bell tower interpreted the millwork found in the original library. The chapel suggests a warm, welcoming, comfortable environment. Across the center hall to the north is a large dining room for staff and retreatants. It also recreates some of the design elements found in the original house, and a former retreatant, Robert Foley, arranged for artist Tamara Kyle Morrison to paint murals in between the paneled sections. Depicting the four seasons, they make this a colorful place in which to dine. 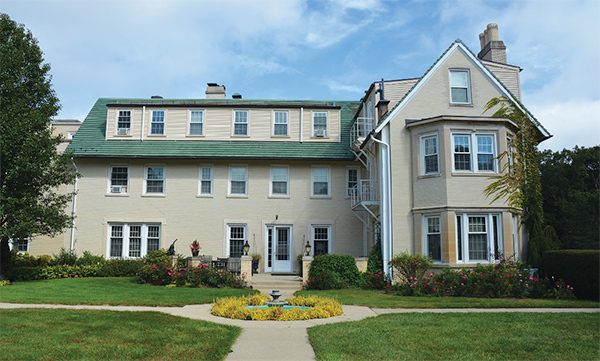 This 1957 addition included 36 more rooms for retreatants and living space for the resident Jesuits. Bellarmine gained in reputation through the years, and the scope of its programs evolved. The leadership and vision of Father John Dillon, S.J. was instrumental in the 2003 expansion of the retreat house which enabled the ministry to offer enhanced retreat space for high school students. For this addition, the award-winning architectural firm of Hestrup and Associates, Architects of St. Charles, Illinois, was called upon to design an addition of over 24,000 square feet, which included a conference center, a small chapel, numerous meeting rooms, and residential accommodations covering three floors. Again, the addition was seamless, replicating many features of the original residence, including another classical staircase, with an identical banister and spindles. Once more, magnificent windows at this western end of the building keep this addition in balance and scale with that early design from the mid-west’s famed architects. Mr. and Mrs. James Beck of Crystal Lake had a special interest in youth retreats and provided the lead gift which made this building possible, together with an endowment for its maintenance. Even though quiet, silence, and reflection are at the core of a Bellarmine retreat, these spaces have a vibrancy about them. There is life; people are moving about. Several generations are participants in embracing the precepts of St. Ignatius of Loyola and bringing them into 21st century ministries. If past is present, it is here indeed. The front door is still painted red and has the original brass door knocker with “The Meadows” engraved in it, signifying that this was the residence of Mr. and Mrs. Frank A. Hecht. Today, were they to return, they’d see that all is well. Peace prevails. “No retreat ever opened under less auspicious circumstances. The stove was not connected until six p.m. which meant that a cold buffet supper had to be served. It was a wonderful repast thanks to Mrs. Ingermann. The altar was not returned from Joe Miller, who was staining it until after six p.m. although Father Thane brought the Blessed Sacrament for benediction. All the retreatants came in on the very last train. The weather was frightfully cold, and the roads were covered with snow drifts. We opened the retreat about 10 o’clock and from then on, we carried on. Those first lay retreatants formed a Jesuit Retreat League with monthly and annual subscriptions to provide scholarships for retreatants who might be limited in their ability to pay. The Retreat League continues to this day, receiving generous support from many who have been inspired by their experience with the programs of Bellarmine Jesuit Retreat House. The Spiritual Leaders of Bellarmine Jesuit Retreat House are (from left) Fr. Michael Sparough, SJ; Fr. James Gschwend, SJ; Mary McKeon; Fr. 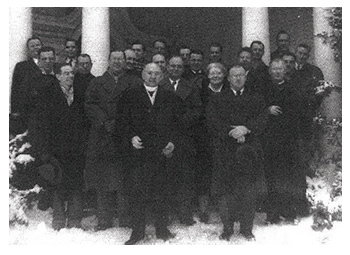 Karl Voelker, SJ; and Fr. Richard McGurn, Superior of the Jesuit Community. The beauty of Bellarmine Jesuit Retreat House goes beyond its vast open spaces, gardens, and architecture. Bellarmine Jesuit Retreat House welcomes people of all faiths to find peace, hope, and serenity in the spirit of faith. In keeping with its mission of spiritual development for people of faith, Bellarmine hosts groups and religious organizations for formation and retreats. In the fall through spring, Bellarmine offers weekend retreats from Friday to Sunday, and day-long spiritual programs. Bellarmine has some unique retreat experiences including programs for those in 12-step recovery and for veterans and military families. Retreatants share that their visit to Bellarmine is the cornerstone of their spiritual practice, offering the space to unpack the larger issues that are challenging to work through amidst the hustle and bustle of a busy life. Retreats fill up early, so reserve your place one-two months in advance. To experience the peace and the quiet, sacred spaces of Bellarmine, start your visit online at www.jesuitretreat.org. For information on individual private retreats or if you are unable to fully fund your retreat please call the Bellarmine office at 847-381-1261. Barbara L. Benson grew up in Kent, England, and later moved to New York. She settled in Barrington and has walked with our history since she first arrived here in 1980.